The father of Oscar Grant III testified Tuesday that he believes his son was intentionally killed at the Fruitvale BART station and he wants monetary damages, in part, to provide for his granddaughter. 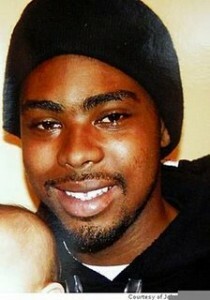 “The man was killed in cold blood: No ifs, ands or buts about it,” said Oscar Grant Jr., testifying for the first time about his son’s notorious slaying at the civil trial where he is suing former BART officer Johannes Mehserle for fatally shooting 22-year-old Oscar Grant III on New Year’s Day 2009. “I don’t care how they say it, it was not an accident. “They took the most precious thing in the world to me — my only child,” said Grant Jr., 50.